Ramayana is one of the two epics of ancient India, togather with Mahabharata. By the designation epic it deals with historical accounts of the life of Rama, the king of Ayodhya. He belonged to the Ikshwaku race, which was as famous as the Kuru race. Ramayana contains 18,000 to 24,000 verses depending on the version. Popular version with 7 Kandas or books (including Uttara Kanda) contains 18,836 verses spanning 606 chapters. Mahabharata contains 84,879 verses spanning 2105 chapters in its 18 Parvas or books. Usually Harivamsha an appendix of Mahabharata is also considered as part of Mahabharata. Harivamsha contains 16374 verses and three more Parvas. Taken together Mahabharata thus contains 101,253 verses. Mahabharata is thus much (around four times) larger than Ramayana. Like Mahabharata is centered around the Kuru race, so is Ramayana centered around the Ikshwaku race. Mahabharata is a historical documentary about the Kurus at Hastinapura and Indraprastha cities belonging to the Kuru Kingdom. Ramayana on the other hand is a historical documentary about the Ikshwakus at Ayodhya belonging to the Kosala kingdom. Panchali, the wife of the Pandavas hails from the kingdom of Panchalas that lied to the east of the Kuru kingdom. Sita, the wife of Rama hails from Videha that lied to the east of Kosala kingdom. Kurus and Panchalas were two closely related tribes during Mahabharata era. Kosalas and Videhas were closely related tribes during the Ramayana era. Vyasa, the author of Mahabharata belonged to the Matsya-Parasara-Vasistha tribe. Valmiki the author of Ramayana belonged to the Valmiki tribe. Vyasa was a great scholar of Vedas, who became later well known as the arranger of Vedas (Veda-Vyasa) where as Valmiki knows little about the Vedas. He belonged to one of the robber tribes, and later became a great sage. It is not clear if Valmiki's lack of knowledge of Vedic lore was because of his lack of formal education (since he belonged to a tribe not associated with the study of Vedas). Another possibility is that, since Ramayana was from an earlier era than Mahabharata, the Vedas in the form of Rik, Yajus, Sama and Atharva were not well defined as such. My analysis shows that Ramayana belongs to the Yajur Vedic period. In other words, during the period of Ramayana Rig Veda was formed but Yajur Veda was being formed. There are some interesting similarities between Ramayana and Mahabharata in their structural composition. Adi Parva is the first Parva or book of Mahabharata. It deals with the general history of the Kurus and describes the early life of the five brothers viz. the Pandavas. In Ramayana we have Baala Kanda as the first book. It deals with the general history of the Ikshwakus and the early life of Rama and his three brothers. Sabha Parva is the second book of Mahabharata, where it describes the city life of the Pandavas at Indraprastha. Ayodhya Kanda describes the life of Rama in the city of Ayodhya. Third comes Vana Parva of Mahabharata describing the forest life of the Pandavas. Similarly in Ramayana we have Aranya Kanda describing the forest life of Rama. Fourth comes Virata Parva of Mahabharata where Pandavas were united with the Matsya kings like Virata who became their ally in their battle with their enemies viz. the Kauravas. In Ramayana we have as fourth, Kishkindha Kanda where we find Rama forming an alliance with the Vanara kings like Sugriva. Fifth in Mahabharata comes Udyoga Parva which deals with war preparations and the march of army to Kurukshetra where the war was to take place. The fifth book of Ramayana viz. Sundara Kanda deals with war preparations and the march of army to Lanka where the war was to take place. Sixth Parva of Mahabharata (Bhishma Parva) describes the 10 day battle (out of 18 days) of Pandavas and Kauravas. Sixth Kanda of Ramayana viz. the Yuddha Kanda of Ramayana deals with the battle of Rama with Ravana. Mahabharata contains a total of 4 books (6.Bhishma, 7.Drona, 8.Karna, 9.Shalya, 10.Sauptika) dedicated to battle, equivalent to Yuddha Kanda of Ramayana dedicated to battle. 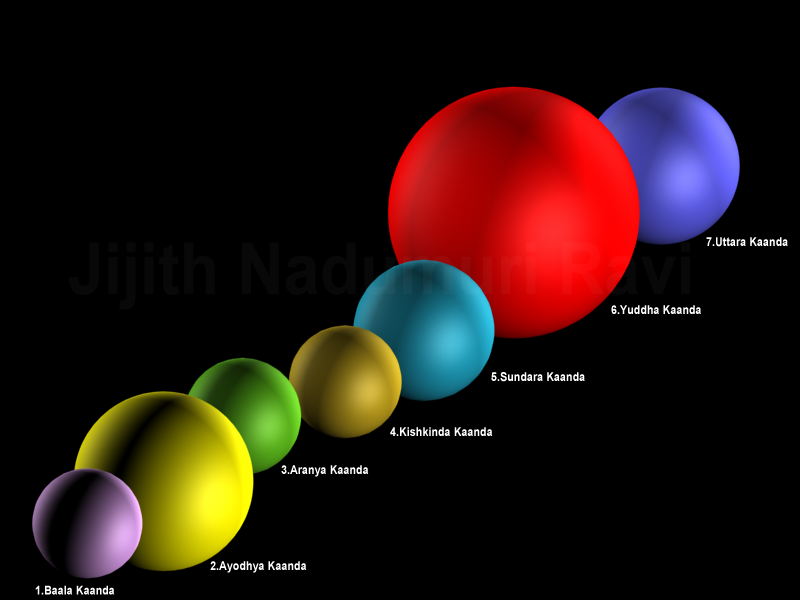 The seventh Kanda of Ramayana viz. Uttara Kanda deals with the life of Rama settled as a king of Ayodha and describe the life of Rama till his death. The subsequent books of Mahabharata from (book 10 to book 18) also contains the life of Pandavas settled as rulers of Hastinapura and describe their life till their death. Ramayana and Mahabharata were continuously updated with new information till 400 AD. The version of Ramayana available today though has a language of later Sanskrit. This might have resulted in the popular misconception that Ramayana was later to Mahabharata, a notion especially held by AIT / AMT theorists. They did this because of their pre-conceived notion that the Aryans migrated to India from west to east. This will require Ramayana that centered around the eastern city of Ayodhya to be later to Mahabharata that centered around the western city of Hastinapura. Tradition correctly places Ramayana earlier to Mahabharata. Mahabharata belongs to Dwapara Yuga and Ramayana to the Treta Yuga the second and third pre-historic Yugas counting backwards into past, starting from Kali Yuga. I find no reason to suspect this traditional view. Thus Ramayana events predates Mahabharata events. Assuming Ramayana-era to be later to Mahabharata-era based on the nature of Sanskrit language used in the composition of Ramayana is a weak hypothesis. If Ramayana events occurred later to Mahabharata events, then Ramayana should contain at least a passing reference to Kurukshetra War occurred between the Kauravas and Pandavas which is the core event mentioned in Mahabharata. We find nothing of that sorts in Ramayana. On the contrary, we have the history of Rama mentioned in Mahabharata many times. At Mbh.3.99 we have it narrated by sage Lomasa in a few verses. At Mbh.3.146 it is narrated by Hanuman. This narration is more than one chapter long. At Mbh.3.272 it is narrated by sage Markandeya. This is 18 chapters long and the longest narration of Ramayana in Mahabharata. There are also more than five passing references of Rama, Sita, Ravana and Ramayana in Book numbers 1, 3, 4, 7 and 18. While many of these can be considered as later additions not all of them can be dismissed as such. One should also then need to explain why history of Rama or Ramayana should be repeated in Mahabharata more than one times. Even if we dismiss all of these as later additions, the absence of mention of any Mahabharata-events in Ramayana undoubtably proves that Mahabharata Era was subsequent to Ramayana Era. 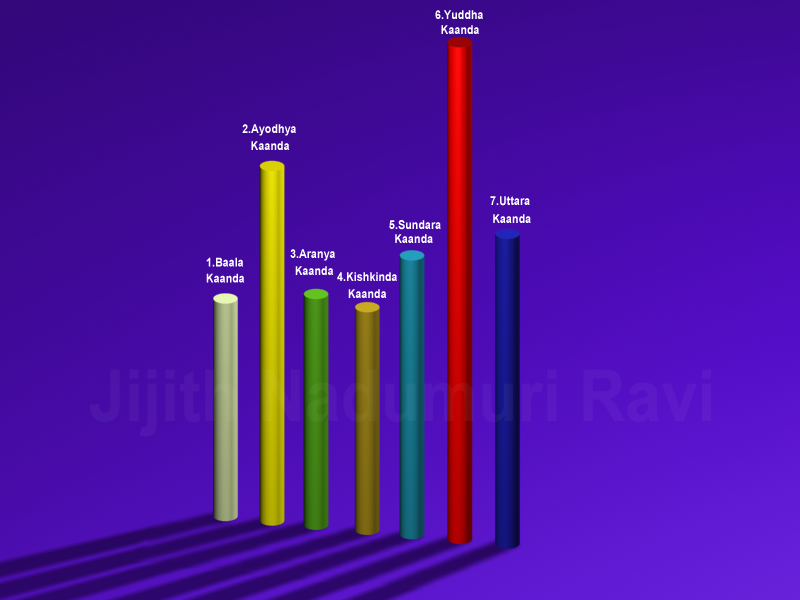 Here I am comparing the popular version of Valmiki Ramayana, containing seven Kandas. The seventh Kanda, viz. Uttara Kanda was formed later. There were considerable later additions to Baala Kanda. Most of Ayodhya Kanda, Aranya Kanda, Kishkindha Kanda, Sundara Kanda and Yuddha Kanda are original works authored by the first Valmiki a contemporary of Rama. Like the casa of Mahabharata (authored by a generation of Vyasas), subsequent Valmikis (people in the generation of the original Valmiki, the contemporary of Rama) have added content to the core of Ramayana. The original Valmiki considered Rama as a human being with greatnesses and weaknesses. He never hesitated in praising the noble deeds of Rama, like the rejection of royal life to protect the word of father. But he was ruthless in describing the weakness of Rama's character and had a critical view on some of his infamous actions like the killing of Vanara Vali and his lack of trust on his wife Sita. In later stages, Ramayana became a Vaishnava text and Vaishnava concepts got added to Ramayana, much like it got added to Mahabharata. As a result of this, Rama became known as the seventh incarnation of Vishnu. The table below shows the number of chapters and verses counted by English translators of Valmiki Ramayana during 19th century. Different versions of Ramayana can differ in the number of chapters and verses. Some versions claim to contain 24,000 verses in total.